Have you ever seen a book trailer? It's exactly like a movie trailer, only (you guessed it) it previews a book that's upcoming. We've decided to do a few book trailers, and I got to tag along for the first one we shot, for a book we're publishing this summer on getting kids outside to observe the natural world. It's by renowned nature journaling educator Clare Walker Leslie, who is the most observant person I've ever met — and everything about the outside excites her. I feel so pale and pasty when I'm with her, but she's working hard to get me to be happy about earthworms. We met at my son's school first thing on a cold, wet, windy, rainy Monday morning. 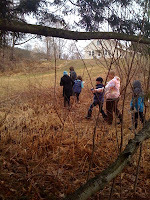 We had a group of six or seven students of varying ages — anywhere from nine to twelve years old. This school actually has a jump on most because nature journaling is part of their curriculum, and the kids are outside for at least an hour on most days, for instruction, play, or sports. They also maintain a garden that students work on when they can, which is a great way for them to see where their food comes from. Clare gave the boys and girls a short "scene-setting" talk to let them know how to listen for birds and what to focus on in their observations. She also let them know that they didn't have to draw especially well or be very good at it, as long as they got down their impressions of what they saw, heard, smelled, or stepped on. 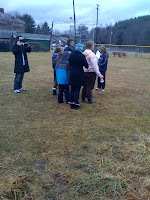 To get two minutes of final video, the shoot lasted about three hours! But in those three hours (and the kids only needed about an hour of that time), Clare expanded everyone's definition of the word "observation." We learned about the change in light at the time of the equinox that makes everything happen, from horses shedding their winter coats to birds and butterflies heading north for the summer. I will let you all know when this wonderful book is ready to go from the bookstore into your child's hands. It's well worth a cold, wet morning spent under a pine tree!